What Happened to Jack Ruby? How Did Jack Ruby Die? The assassination of President John F. Kennedy on November 22, 1963, is a wound that has never healed. The federal government released the files regarding the assassination for public viewing, putting the focus back on nightclub owner, Jack Ruby. Ruby killed Lee Harvey Oswald, the man accused of assassinating Kennedy, and gave different motives for his actions. President John F. Kennedy was assassinated over half a century ago in Dallas, Texas, on November 22, 1963, supposedly by a lone gunman named Lee Harvey Oswald. However, the public’s appetite for information was not satiated despite the many media reports, documentaries, and films made about the tragic incident. After delaying it for years, the federal government finally released the files about the Kennedy assassination for public viewing on Thursday, October 26, 2017. This is expected to rest the speculations regarding the assassination of Kennedy, and the subsequent conspiracy theories that are floating around to this day. Lee Harvey Oswald, the man accused of killing Kennedy, was shot to death by a nightclub owner named Jack Ruby. Since then, people have wondered what happened to Jack Ruby and who killed him. Here is everything we know about Jack Ruby’s death. Born on March 25, 1911, in Chicago, Illinois, to Fannie Rutkowski and Joseph Rubenstein, Jack Ruby was 52 years old when he killed Oswald. Ruby was a Dallas, Texas, nightclub owner who fatally shot Oswald on November 24, 1963, while the latter was in police custody after being charged with the assassination of President Kennedy. Since then, various groups believed that Ruby was involved with members of organized crime, and he killed Oswald as part of an overall plot regarding Kennedy’s assassination. However, an official investigation conducted by the Warren Commission in September 1964 concluded that Ruby acted alone. There has been confusion regarding Jack Ruby’s motive for killing Oswald. Different theories surfaced about why the murder was committed just two days after Kennedy’s assassination. Some believe that Ruby killed Oswald on behalf of organized crime to silence him and prevent Oswald being further interrogated. Meanwhile, others think that the murder was motivated by money, as Ruby was known as being a gambler, and smuggled guns and ammunition to Cuba for a fee. What did Ruby say about his motive? His statements changed over a period of time. 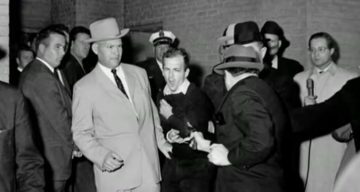 After his arrest, Ruby told several witnesses that he killed Oswald because he was distraught over Kennedy’s death and wanted to “redeem” the public’s view of Dallas. He said that Oswald’s death would spare Jackie Kennedy the discomfort of going to trial. How Did Jack Ruby Die? On December 9, 1966, Ruby was admitted to the Parkland Hospital in Dallas, as he suffered from pneumonia. Doctors found that he had cancer in his liver, lungs, and brain. He died on January 3, 1967, due to a pulmonary embolism, secondary to lung cancer, at Parkland Hospital. With the release of the JFK files, people are hoping that the truth will come out, and the conspiracies surrounding it will be put to rest.